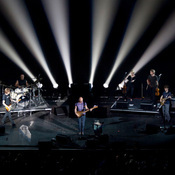 Enter to win tickets for Sting's Back to Bass tour! On November 16, Sting will perform at the Verizon Theatre in Grand Prairie, TX and we're giving away a pair of tickets to two randomly selected fans. Enter to win by November 15 at 11AM EDT using the form below…it's that easy! Please provide your email address and the show date (November 16) to enter. Winners will be notified on Tuesday afternoon. This event has now ended. The two winners were Kelly Galbreath and Suzanne Gabriel.